The 32 companies licensed in Arkansas to sell medical marijuana have sometimes faced challenges in finding commercial real estate zoned for a dispensary. Two dispensaries in midtown Little Rock, Grassroots OPCO and Natural State Wellness, will sit about 1,100 feet from each other. It’s no coincidence that Little Rock’s first two medical marijuana dispensaries will be within shouting distance of each other. In Arkansas’ biggest city, dotted with churches and schools, there weren’t many choices. Pinpointing legally permissible real estate for the state’s first medical cannabis enterprises after a 2016 legalization vote was like plunging into the haystack to find the perfect spot for a needle, those involved in the process say. The state’s 32 licensed cannabis dispensaries had to land at least 1,500 feet from any school, church or day care center. The five licensed cultivation companies faced a 3,000-foot buffer. The difficulty was on display as recently as Wednesday, when the Arkansas Medical Marijuana Commission gave three dispensaries permission to move before they even opened. One company, RXMed Inc., will scoot 50 miles down Interstate 30 from Prescott to Texarkana. It said it vetted 15 possible sites in the town of 3,000, but not one unquestionably met requirements. 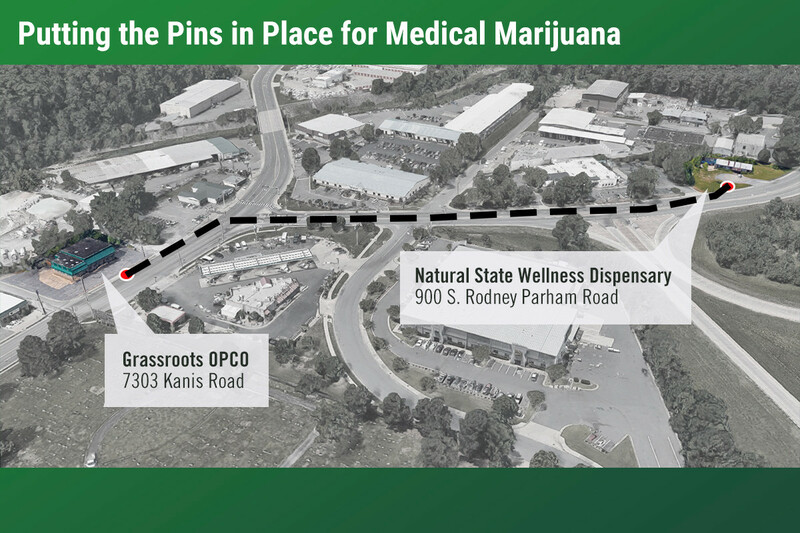 A rare regulatory sweet spot emerged in Little Rock at the confluence of 12th Street, South Rodney Parham Road and Kanis Road, where the Grassroots OpCo and Natural State Wellness dispensaries will be within about 1,000 feet of each other. Grassroots, at 7303 Kanis, will occupy the longtime Joubert’s Tavern building, and Natural State Wellness will be just to the north at 900 S. Rodney Parham, the former art space Gallery 360. Both stores will be making renovations to open this year. “Struggle is a mild term for the challenge of meeting these strict siting requirements,” said Robbin Rahman, a Little Rock lawyer whose parents co-own a dispensary set to open in Conway. Parcels available for sale or lease also had to meet commercial zoning requirements, which for dispensaries meant a site zoned to allow a retail pharmacy. The land scramble that surged through all of 2017 also set off a boom in real estate options, many renewed time and again as the medical marijuana startup process stretched months and years beyond initial expectations. During the boom, scouts fanned out across the state to vet likely properties, snapping up options and even buying projects “on spec.” The result was a temporary and quite specific bubble, similar to those seen in other states with legal cannabis, but limited by Arkansas’ decision to award licenses to only 37 businesses. Dan Roda, a Little Rock lawyer who took part in the rush before co-founding Abaca, a cannabis banking service, estimated that more than 300 properties statewide were locked down just before the state’s September 2017 deadline for dispensary and cultivation applications. Amendment 98 to the state Constitution set up eight cannabis zones in Arkansas, with up to four dispensary spots designated for each. Finding qualifying sites was tedious in all zones, but the toughest was Zone 5, including Little Rock, Conway and Sherwood, where Natural Relief Dispensary is building a store at 3107 E. Kiehl Ave. Some savvy investors cashed in even if their own quests for medical marijana licenses failed. Henry P. Willmuth paid $342,250 in August 2017 for the former Joubert’s property through his 7303 Kanis LLC. He didn’t get a cannabis license, but sold the property last month for $900,000, a cool 163% return. The buyer, GR Properties, is affiliated with Grassroots OpCo, the Chicago-based dispensary operator that will be opening the Kanis dispensary. Grassroots had originally planned to place its dispensary in Ward, in Lonoke County north of Jacksonville, but obtained state permission to move to Little Rock. The dispensary in Conway, Rock City Harvest LLC, also got clearance to move last week, from 3740 Prince St. in residential west Conway to a far more commercial area near Interstate 40. The new site, at 1200 Thomas G. Wilson Drive, is owned by Conway Commercial Warehousing, led by Joe Thielke, who owns a million SF of local warehouse space. 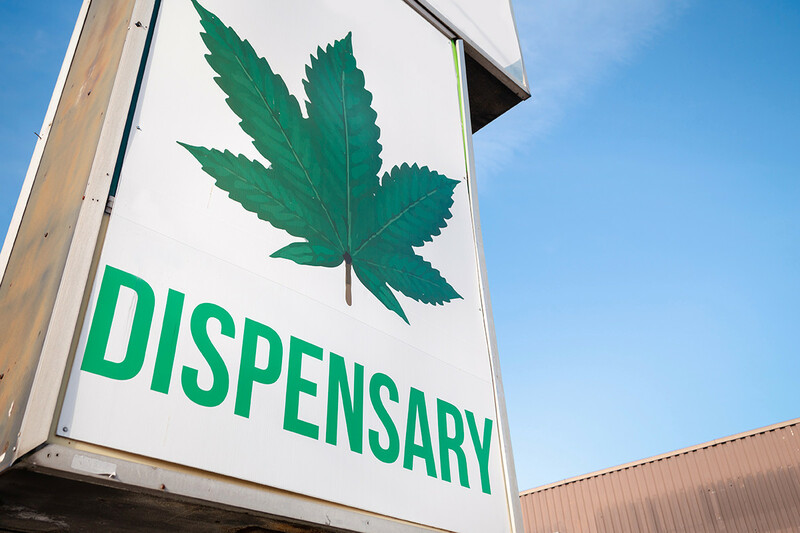 “I’ve owned the property for 10 or 12 years but built the building about seven years ago,” Thielke told Arkansas Business, describing the dispensary space as 5,000 SF with a fenced yard. He wouldn’t reveal how much rent he’s charging. Rahman, the dispensary’s compliance officer, said his family fell in love with Conway when he attended the Arkansas Governor’s School there as a teenager. His father and mother, Mizan Rahman and Elizabeth Barnett, together own 75% of the dispensary. Bold Team LLC of Cotton Plant (Woodruff County) expects to harvest the state’s first legal cannabis crop around April 24, according to Robert Lercher, director of customer relations. Drying, packaging and distribution will take another two weeks, “give or take,” he said. Bold Team, which has more than 8 acres and 45,000 SF of growing and processing space, leases its land from the city of Cotton Plant for $1,500 a month. But Bold Team has also promised the city 1% of gross sales, which would be significant. Sales by individual cultivators could approach $2 million a month, some analysts predict, though Bold Team officials call that speculation. The market in Arkansas is untested, but some 10,000 residents have already obtained medical cannabis cards from the state. When the program is mature, Bold Team estimates that 60,000 to 90,000 Arkansans will have cards. “Nationally, a good dispensary might do $150,000 in gross sales a month,” said Roda, the co-founder of Abaca. In 2018, Marijuana Business Daily of Denver estimated sales in emerging cannabis markets, predicting eventual sales in Arkansas of $45 million to $65 million a year. Another cultivation site, Natural State Wellness Enterprises, got a great deal on its 20-acre site at 4001 Comet Drive in Newport, where the Newport Jackson County Industrial Development Bond Board authorized the sale for $101. Natural State Wellness had the option of locating in Newport or Pine Bluff, and the sale price was definitely a lure, said Jon Chadwell, director of the Newport Economic Development Commission. “We had the land priced at $7,500 an acre, but we can negotiate prices down according to the number of jobs projected and expected wages,” Chadwell said. The cultivation center startup was expected to bring 35-45 jobs at pay of $50,000 to $55,000 a year, he added. Newport won two of the state’s five cultivation sites. The second is Delta Medical Cannabis Co., which bought its 5-acre site at 3698 Rice Road from Holden Conner Land II LLC for $218,000, according to Jackson County records. RXMed Inc., Grassroots OpCo, Natural Relief Dispensary, Rock City Harvest LLC, Conway Commercial Warehousing, Joe Thielke, Mizan Rahman, Elizabeth Barnett, Scott Hardin, Newport Jackson County Industrial Bond Board, Arkansas Medical Marijuana Commission, Natural State Wellness Enterprises, Joubert's Tavern, Gallery 360, Robbin Rahman, Dan Roda, Abaca, Henry Willmuth, The Outlets of Little Rock, Doctors Orders RX, Arkansas Department of Finance and Administration, Bold Team LLC, Robert Lercher, Jon Chadwell, Newport Economic Development Commission, Delta Medical Cannabis Co.